We had a Dark Days challenge this week: one-pot meals. I tried to come up with something super-creative, but struggled to find something that didn’t use exotic ingredients. In the end, I decided to make some braised short ribs with some of the veggies I’m still getting from the garden, so not only is this local, much of it was picked just prior to cooking. Not flashy, but turned out just fine. 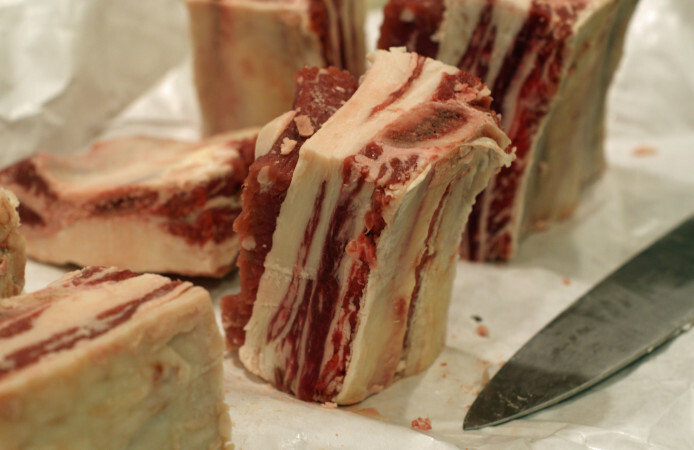 Short ribs seem to be increasing in popularity lately, and have made their way to the menus of many prominent local restaurants. 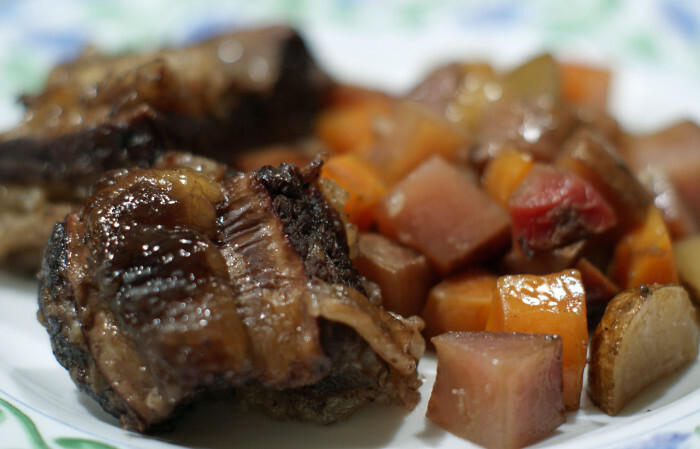 They’re certainly not a lean meat, but when cooked slowly, are very tender and flavorful. We had two packs still in the freezer, and I don’t think I’ve ever prepared short ribs, so I thought now would be a good time to try them. They were packaged in a single slab, so I had to cut them apart myself. One thing about buying bulk meat that we’ve noticed is that it’s not usually as “pretty” as what you’d get in a store (or maybe it’s just our supplier?) – not trimmed of all the excess fat, sometimes a rough cut or large pieces, etc. Not as convenient as just popping it out of its packaging into the pan, but I find I don’ t really mind. It only takes a couple minutes of prep time, and I get to hone my meat-cutting skills. With the crazy freeze/thaw weather that this winter has consisted of, I’m not sure what I was expecting in the garden, but I pulled up some beets, carrots, and a couple onions, and surprisingly, all were still in pretty prime condition (the outermost layer of the onions was kind of icy, but the inside was still good). I know, ideally I should have pulled everything and put it into storage, but I’ve never picked carrots and always just go pull them out when I need them (and when I can get to them through the snow), and I figured beets would behave similarly. The potatoes I did actually dig up and store in the basement, but some of them are starting to sprout, so I’m afraid we may need to eat a lot of potato dishes in the near future. I also picked up a bottle of red wine from Debonne Vineyards, located in nearby Madison, specifically for this recipe. In a Dutch oven, melt the butter over medium heat, add the garlic and onion, and cook for a minute or two, until they start to get soft. We got a nice Lodge enameled cast-iron Dutch oven for Christmas, which is perfect for this dish, and which we’ve already used quite a bit. Add the ribs and cook each side for about a minute each, until brown. Pour in the wine (should cover about 2/3 of the meat; add more if necessary), and bring to a low simmer. From here, you can either keep on the stove at a low simmer or move to a 325 F oven (I kept it on the stove). In either case, cover and let it go for 2 1/2 to 3 hours. With about 30 minutes left in the cooking time, I added the vegetables – I wanted them tender, but cooking for the full 3 hours may have just disintegrated them. When it’s all done, you’ll be left with a pot full of meat and vegetables, drowning in a pool of liquefied fat. I took everything out onto a separate plate before serving, but that’s just me. The meat was cliché – fall-off-the-bone tender – and had good flavor, not too wine-y. Prep time is minimal, but if you’re in a pinch for time, cook it the day before or start it early (we didn’t eat until 9:00). Whatever time you do it, it fills the house with good smells and makes another perfect meal for a chilly night. Those look good! I am hoping to get a dutch oven soon. Everyone who has one seems to love them!